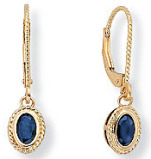 Palm Beach Jewelry has the perfect birthstone Dazzling Ear Drop earrings! Genuine gemstones are set in 10K gold. Just pick your birth month and get ready to sparkle! While supplies last they are only $69.99 That's 65% off the original list price. Orders over $75 are shipped for free. Click Here!